Left: Andrew Hogg, Jamie Pace, Luke Dimech, Jordi Cruyff, Steve Borg, Roderick Briffa. The new acquisitions for this season were coach Ton Caanen and Jordi Cruyff together with Dutch striker Geert Den Ouden and defender Steve Borg from Mosta F.C and prolific striker Terrence Scerri from Hibernians, Kevin Sammut from Marsaxlokk. Irish striker Declan O’Brien. On the 10th March, striker Michael Mifsud joined the club till the end of the season. Defender Josef Mifsud left the club and joined Sliema Wanderes and Dylan Zarb joined Dingli Swallows. Striker Geert Den Ouden was released from the club on November 2009. The team was under the guidance of Ton Caanen, Jordi Cruyff was his assistant while Nicky Saliba was the team manager. For the first time The Euro Cup competition was played between four teams. 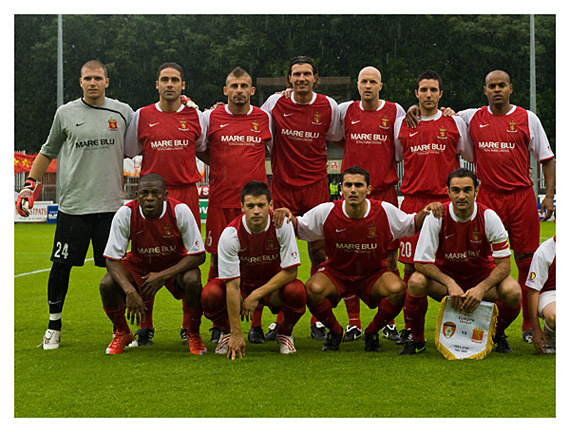 The competition kicked-off on the 22nd July, Valletta lost their first match against Hibernians 0-2. In the second match Valletta won the encounter against Birkirkara 2-0, in the last match Valletta lost again 0-2 against Sliema Wanderers. In the Europa League competition Valletta were drawn against Kevlavik. The first leg was played in Malta on 2nd July, Valletta won the match 3-0, goals by Dyson Falzon, Njongo Priso and Geert Den Ouden. The away leg was played on 9th July, the match ended 2-2, the goal for the Citizens were scored by Dyson Falzon and Njongo Priso. Valletta F.C. became the third Maltese team to qualify for the second round and the first team in this competition. During the second leg Valletta met St. Patricks from Ireland. The first match was played in Ireland on 16th July, Valletta had an excellent performance and a superb goal by captain Gilbert Agius levelled matters for the Citizens. The second leg was played on 23rd July at the Centenary Stadium – Ta’ Qali, a goal by Declan O’Brien on the 80th minute eliminated Valletta from the competition. Left: Andrew Hogg, Kenneth Scicluna, Luke Dimech, Geert Den Ouden, Jordi Cruyff, Dyson Falzon, Jamie Pace. Front: Njongo Priso, Steve Bezzina, Roderick Briffa, Gilbert Agius. 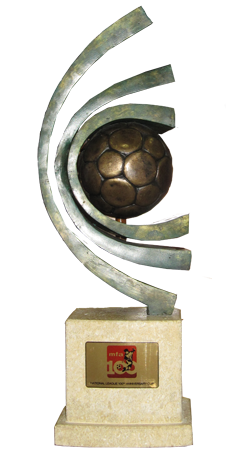 Valletta entered this prestigious competition on 4th December against Gozo F.C. winning the match 7-0. The scorers were Jordi Cruyff twice, Dyson Falzon, Steve Borg, Edmund Agius, Roderick Briffa and Stefan Giglio. In the second match of the competition Valletta met Vittoriosa Stars, winning the encounter 3-0, with all goals coming from Ian Zammit. During the quarter finals played on 9th February, Valletta met Hibernians and won the match 2-0, goals by Roderick Briffa and Kevin Sammut. In the semi final against Tarxien Rainbows, Valletta had to fight hard. The game had to go into extra time after the result was 1-1 after the ninety minutes. Valletta won the match 3-1, the scorers were Gilbert Agius 65’, Michael Mifsud 97’ and Njongo Priso 115’. The final of this competition was played in front of the largest crowd of the season. 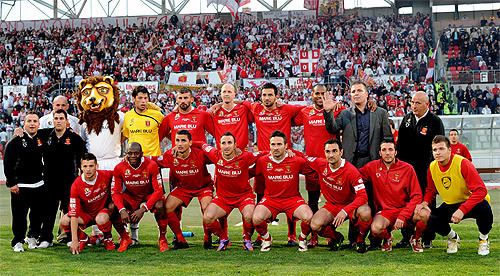 Valletta succeeded in winning this prestigious honour against rivals Floriana. 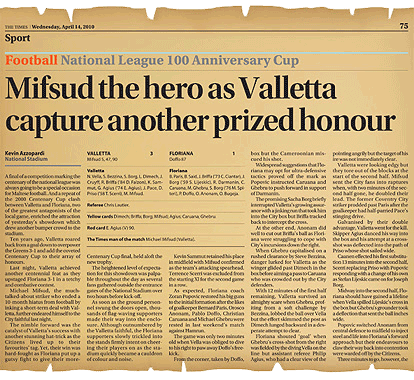 Michael Mifsud was the Citizen’s hero as he scored three goals in the 5’, 47’ and 90’. Pablo Doffo scored the goal for the Greens in the 87th minute. The BOV Premier League started on a negative note. The MFA decided on 31st August, that the Premier League shall stop and resume on the 17th September following a corruption case involving Marsaxlokk F.C. and Vittoriosa F.C. The Premier League resumed on September 26 and 27, with both clubs mentioned before relegated to the First Division. Msida SJ and Hamrun Spartans were transferred to the Premier League instead. Valletta played 28 matches, winning 20 and losing 4. The Citizens lost against Sliema Wanderers twice, against Hibernians and Birkirkara. They were held in a draw 4 times, twice against Tarxien Rainbows and Msida SJ and against Birkirkara. They scored 71 goals and acquired 25. They gained 44 points at the end, a pointless against Champions Birkirkara. Striker Terrence Scerri was the club’s top scorer with 20 goals. Defender Luke Dimech was suspended from the club till the end of the season following an incident during a match against Sliema Wanderers. Valletta started their commitments in this competition on 3rd April in a match against Birkirkara. They eliminated the Stripes 3-1, the scorers were Jamie Pace, Michael Mifsud and Declan O’Brien. During the semi final, Valletta met Hamrun Spartans. Following a scrappy performance after the 90 minutes the result ended goalless. The Citizens won the match 6-5 through a penalty shoot out after. Andrew Hogg became the Citizens hero; he saved no less than two penalties. The final of this competition was played on Sunday 23rd May, a large crowd of Valletta supporters was present for this final. Valletta won the FA trophy for the 12th time in their history, eliminating Qormi by 2-1, goals by Michael Mifsud, Terrence Scerri and Njongo Priso. Njongo Priso also missed a penalty on the 64th minute. After the match an open top bus carried the players to the streets of Valletta. The National League 100 Anniversary Cup was organised by the Malta Football Association to commemorate the 100 Years of National League Football and the 50th Anniversary of the MFA's membership of both UEFA and FIFA. This competition was open for all clubs from the Premier League to the Third Division. Valletta and Floriana entered this competition in the third round. Valletta captain Gilbert Agius took part in both the Centenary Cup triumph in his side's identical 3-1 score line against Floriana themselves in 2000 and also in the final of this competition, becoming the only player in Maltese football to have won these two one-offs trophies which came around at the turn of a hundred years. VALLETTA: N. Vella, S. Bezzina, G. Agius (E. Agius), N. Priso (T. Scerri), L. Dimech, S. Borg, J. Cruyff, J. Pace, K. Sammut, M. Mifsud, R. Briffa (D. Falzon). FLORIANA: B. Paris, B. Said, J. Briffa (C. Ciantar), J. Borg (S. Lijeskic), O. Bugeja, R. Darmanin, C. Caruana, M. Ghebru, S. Borg (M. Spiteri), P. Doffo. O. Anonam. A final of a competition marking the centenary of the national league was always going to be a special occasion for Maltese football. And a repeat of the 2000 Centenary Cup clash between Valletta and Floriana, two of the greatest antagonists of the local game, enriched the attraction of yesterday's showdown which drew another bumper crowd to the stadium. Ten years ago, Valletta roared back from a goal down to overpower the Greens 3-1 and add the coveted Centenary Cup to their array of honours. 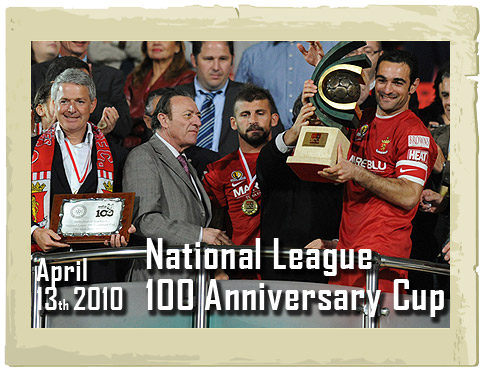 Last night, Valletta achieved another centennial feat as they upstaged Floriana 3-1 in a tetchy and combative contest. Michael Mifsud, the much-talked-about striker who ended a 10-month hiatus from football by inking a short-term deal with Valletta, further endeared himself to the City faithful last night. The nimble forward was the catalyst of Valletta's success with another stunning hat-trick as the Citizens lived up to their favourites' tag. Yet, their win was hardfought as Floriana put up a gutsy fight to give their more-quoted rivals a good run for their money. completing his treble on the stroke of time as chants of 'Ole Ole Michael Mifsud' and 'Mitt sena o?ra' resonated around the stadium. The thousands of City aficionados celebrated wildly at the final whistle and a loud cheer rose into the Ta' Qali air when captain Gilbert Agius, who also played for Valletta in the Centenary Cup final, held aloft the new trophy. The heightened level of expectation for this showdown was palpable throughout the day as several fans gathered outside the entrance gates of the National Stadium over two hours before kick-off. As soon as the ground personnel swung the doors open, thousands of flagwaving supporters made their way into the enclosure. Although outnumbered by the Valletta faithful, the Floriana supporters slowly trickled into the stands firmly intent on cheering their players on as the stadium quickly became a cauldron of colour and noise. Given the magnitude of the occasion, it was thought that the two teams would do their pre-match warm-up on the pitch of the National Stadium but this was not forthcoming. Caanen awarded the no.1 jersey to young goalkeeper Nicky Vella who guarded City's goal in their previous matches in this competition. Central defender Luke Dimech and right-back Steve Borg reclaimed their place in the team after suspension kept them out of Saturday's 3-0 victory over Tarxien in the league. Kevin Sammut retained his place in midfield with Mifsud confirmed as the team's attacking spearhead. Terrence Scerri was excluded from the starting XI for the second game in a row. As expected, Floriana coach Zoran Popovic restored his big guns to the initial formation after the likes of goalkeeper Bernard Paris, Orosco Anonam, Pablo Doffo, Christian Caruana and Michael Ghebru were rested in last weekend's match against ?amrun. The game was only two minutes old when Vella was obliged to dive to his right to paw away Doffo's free-kick. From the corner, taken by Doffo, Floriana came close to taking the lead as Ryan Darmanin's goalbound header was cleared off the line by Sammut. Reprieved by Sammut's intervention, Valletta drew first blood from their first telling raid on Floriana's goal. Racing onto a pass from midfield, Mifsud darted past a hesitant Anonam and Paris and sidefooted the ball into the net from a tight angle. Valletta, in an all-red kit, could have made it 2-0 when Sammut's header from Roderick Briffa's cross broke to Doding Priso in the box but the Cameroonian miscued his shot. Widespread suggestions that Floriana may opt for ultra-defensive tactics proved off the mark as Popovic instructed Caruana and Ghebru to push forward in support of Darmanin. The promising Sacha Borg briefly interrupted Valletta's growing assurance with a jinking run that took him into the City box but Briffa tracked back to intercept the cross. At the other end, Anonam did well to cut out Briffa's ball as Floriana were struggling to cope with City's incursions down the right. When Ghebru capitalised on a rushed clearance by Steve Bezzina, danger lurked for Valletta as the winger glided past Dimech in the box before aiming a pass to Caruana who was crowded out by the City defenders. With 12 minutes of the first half remaining, Valletta survived an almighty scare when Ghebru, profiting from a soft challenge by Bezzina, lobbed the ball over Vella but the effort skimmed the post as Dimech lunged backward in a desperate attempt to clear. Floriana shouted 'goal' when Ghebru's cross-shot from the right was fielded by the diving Vella on the line but assistant referee Philip Agius, who had a clear view of the action, deemed otherwise. As the first half moved on, the battling Greens gained in confidence. On the stroke of half-time, they threatened an equaliser when Joseph Borg made the most of Valletta's lethargy by advancing into the box but his low strike rolled past the far post. The half-time whistle triggered an appreciative applause from the Floriana faithful as an animated Popovic exhorted his players to keep up the fight. At the entrance of the tunnel close to the Valletta side Priso was spotted pointing angrily but the target of his ire was not immediately clear. Valletta were looking edgy but they tore out of the blocks at the start of the second half. Mifsud sent the City fans into raptures when, with two minutes of the second half gone, he doubled their lead. The former Coventry City striker prodded past Paris after the goalkeeper had half-parried Pace's stinging drive. Galvanised by their double advantage, Valletta went for the kill. Skipper Agius danced his way into the box and his attempt at a cross-shot was deflected into the path of Priso whose shot sailed wide. Lijeskic came on for Joseph Borg. Midway into the second half, Floriana should have gained a lifeline when Vella spilled Lijeskic's cross in the box but Ghebru's grounder took a deflection that sent the ball inches wide. Popovic switched Anonam from central defence to midfield to inject steel and life into Floriana's forward approach but their endeavours to claw their way back into contention were warded off by the Citizens. Three minutes to go, however, the Greens resurrected their hopes when Doffo surprised Vella with a well-hit strike from long range. The erstwhile subdued Floriana fans suddenly dared to dream but their optimism was cut short when Valletta made it 3-1 on the stroke of time. Dyson Falzon, a second-half substitute for Briffa, dashed forward on the left before directing a low pass to Mifsud who finished with aplomb. In stoppage time, Edmond Agius, who had replaced Gilbert Agius, was redcarded for kicking at Ghebru. After missing out on the BOV Premier League title, Valletta finished off the season on a positive note as they won the U*BET FA Trophy, defeating Qormi 2-1. For the Citizens, this was the twelfth FA Trophy win and the second honour of the season after winning the National League 100 Anniversary Cup. This result also means that Valletta will be taking part in the UEFA Europa League as cup winner and starting from the second qualifying round rather than the first. Valletta showed greater determination during the first half, taking a well-deserved two-goal lead. However after missing a penalty, they allowed Qormi to reduce the gap through another penalty with the Yellows going all out in search of the equaliser in the dying minutes. Valletta coach Ton Caanen welcomed back Edmond Agius and Gilbert Agius but still could not field his best formation due to absence of Steve Bezzina and Jamie Pace. Vince Carbonaro, on the other hand, had the full squad at his disposal with the return of Alfred Effiong from suspension. Valletta managed to take the lead on the 8th minute when off a perfect pass by Njongo Priso from the left, Michael Mifsud managed to beat Matthew Farrugia with a low diagonal shot. The Citizens doubled the score on 21 minutes when off a cross by Roderick Briffa from the right, Terence Scerri slammed the ball home past Farrugia. Another shot from Terrence Scerri on the 33rd minute, was blocked by the Qormi goalkeeper following a cross by Edmond Agius from the right and a minute later, Alfred Effiong tried his luck with a diagonal shot from the right which ended just wide. On 64 minutes, Valletta were awarded a penalty after Stephen Wellman brought Njongo Priso down inside the area. However Priso’s shot from the penalty spot hit the crossbar. Qormi opened the score on the 78th minute when they were awarded a penalty after Camilo was floored inside the area by Gilbert Agius. From the penalty spot, Camilo made no mistake. In the remaining minutes of the match, Qormi tried their best to notch the equaliser and force extra-time but the Valletta defence managed to hold on until the final whistle and bring the U*Bet FA Trophy in the capital for the 12th time in the club’s history.